The Swiss digital health and wellbeing company dacadoo wins the Public Award at the Swiss ICT Awards 2013, the “Oscar” of the IT industry in Switzerland, at the KKL congress center in Lucerne. Lucerne, Switzerland – The innovative dacadoo health, lifestyle navigation and wellbeing platform (www.dacadoo.com) gets most votes from the public and wins the prestigious Public Award at the Swiss ICT Awards 2013 in Lucerne, the “Oscar” of the IT industry in Switzerland. More than 800 invited guests from politics and executives from the industry celebrated 10 finalists among 3’100 ICT companies in Switzerland who competed in 3 categories for the Swiss ICT Award 2013 at the beautiful KKL congress center in Lucerne. The dacadoo Health Score Web Platform and the dacadoo app for smartphones enable people to track, document and benchmark their health and wellbeing in real-time in an easy and fun way. dacadoo gives users a personal Health Score from 1 (low) to 1000 (high), which moves up or down depending on how the body, emotional wellbeing, and activities (exercise, nutrition, stress and sleep) change. The Health Score is based on “big data” with several tens of millions of person-years of clinical data and incorporates many of the well-known cardio cerebrovascular risk studies and quality of life assessment tools. dacadoo systematically applies techniques from the gaming industry, group dynamics from social networks and provides relevant lifestyle feedback to users to engage and motivate them to use the Health Score Platform regularly and thereby adopt a healthier lifestyle. Through the annual Swiss ICT Award ceremony, the ICT industry in Switzerland celebrates the best of the industry. 10 finalist companies were selected among the 3’100 Swiss ICT companies and competed to win the “Public Award”, “Newcomer” and “Champion” of the Swiss ICT Award 2013, also known as the “Oscar” of the Swiss IT industry. For several weeks, the public was asked to vote for their favorite company on various online media in Switzerland and dacadoo got most votes from the public and thereby wins the Public Award of the Swiss ICT Award 2013 in Lucerne. After selling Asset4 to ThomsonReuters in New York in 2009, the experienced entrepreneur Peter Ohnemus founded dacadoo in early 2010 and he is fully involved as President & CEO of this rapidly growing company. 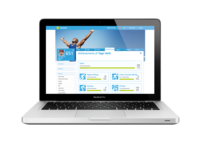 Proudly he states “This is a big recognition of the dacadoo Health Score and the dacadoo online lifestyle navigation platform. The award will help dacadoo make the Health Score a global standard in Health Outcome”. dacadoo is working with strategic international partners in the insurance, fitness & wellness, mobile telecommunications and media sectors to bring the dacadoo Health Score and the dacadoo Health Score Platform to market and has already launched its solution in the UK, Germany and USA. The dacadoo Health Score Platform is a mobile online health and lifestyle navigation platform that provides users with a simple, safe and fun way to measure their personal health and fitness in real time. 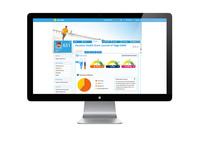 The platform calculates your personal dacadoo Health Score which is a number between 1 (bad) - 1,000 (perfect). The dacadoo Health Score is an indicator of your current health and wellbeing. The integration of Social, Local and Mobile (SoLoMo) combined with the principles from the gaming industry, motivate users in a simple way to track, document and benchmark their personal health, fitness and active lifestyle in real time. The dacadoo Health Score was developed by dacadoo in collaboration with a professor and former scientists from MIT in Boston. The dacadoo Health Score is based on several tens of million people-years of clinical data and therefore takes into account many of the known cardiovascular, quality of life questionnaires and health studies. The company is working with strategic partners in the insurance, mobile telecommunications, health, science, fitness / wellness and media sectors to make business and private customers healthier and happier. dacadoo ag has offices in Zurich, Switzerland and San Francisco, USA.